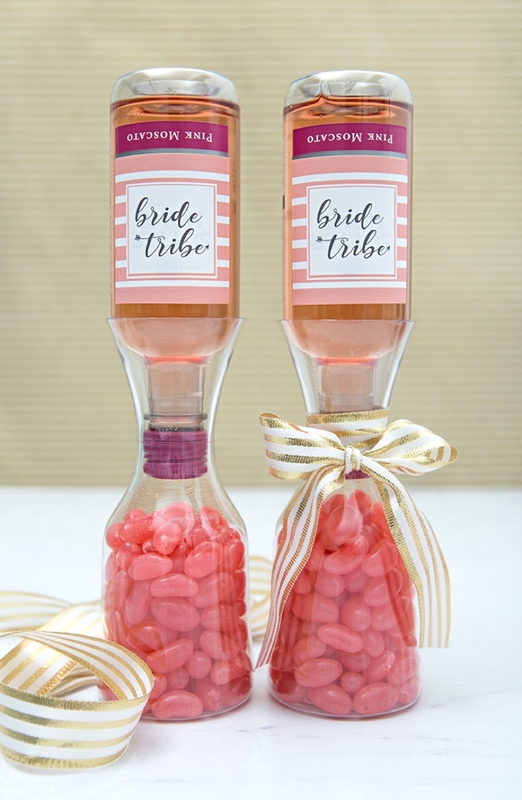 How Adorable Are These DIY Mini-Wine Carafe Bridesmaid Gifts!? 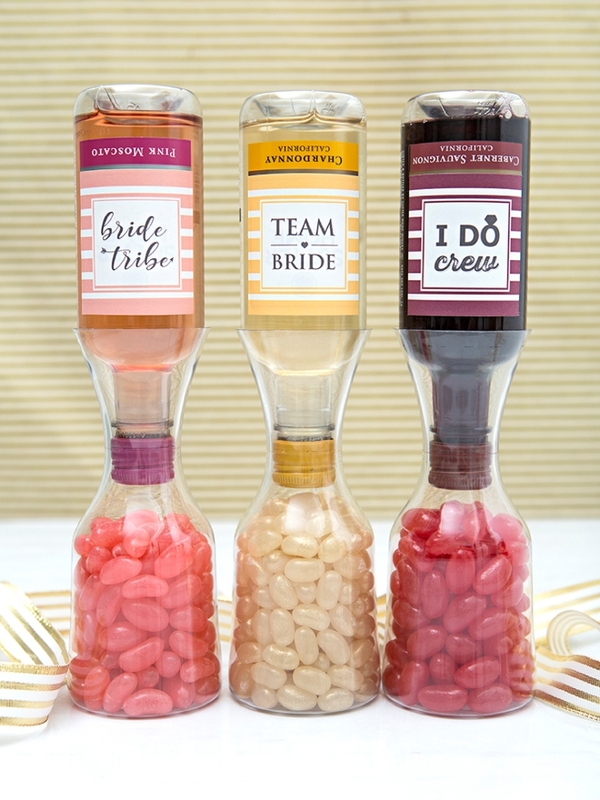 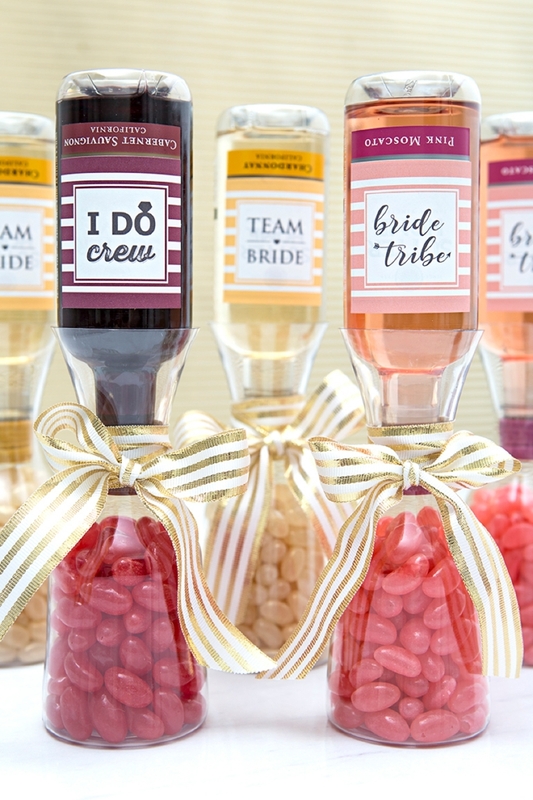 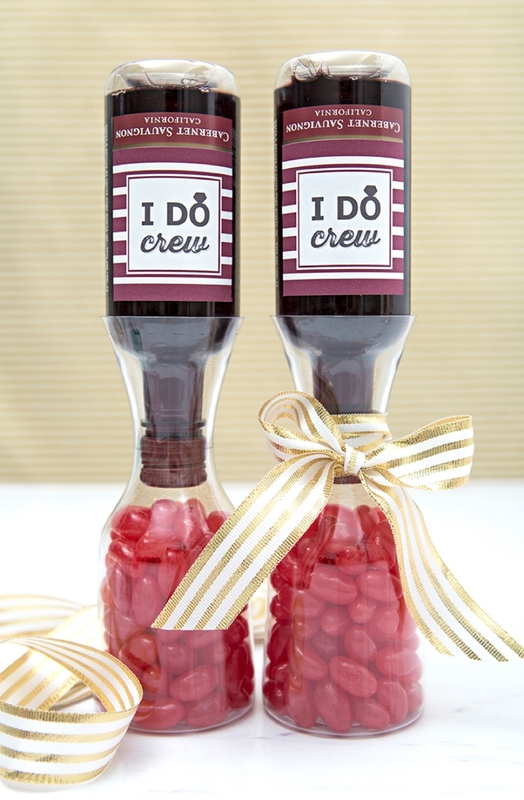 Everyone deserves a little wine and a little candy, especially your bridesmaids! 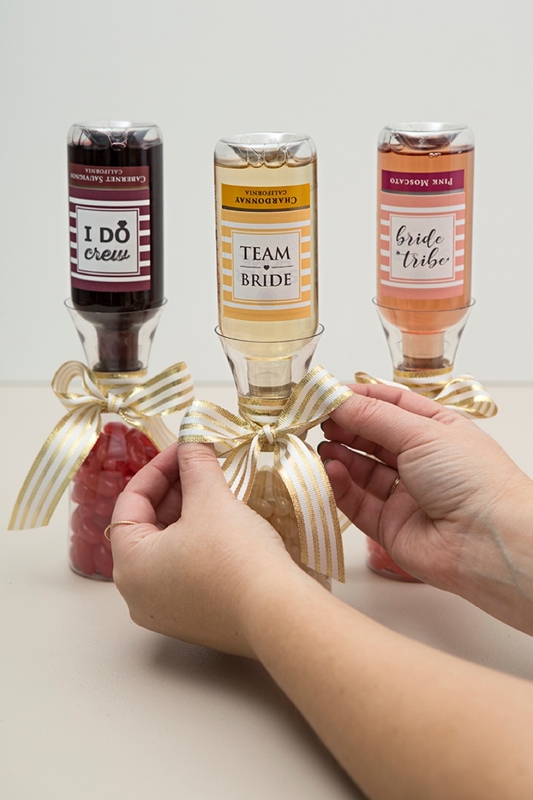 In this DIY mini-wine gift idea, we’re combining a darling plastic mini-carafe, a mini bottle of wine and jelly beans to make a super sweet present for your besties. 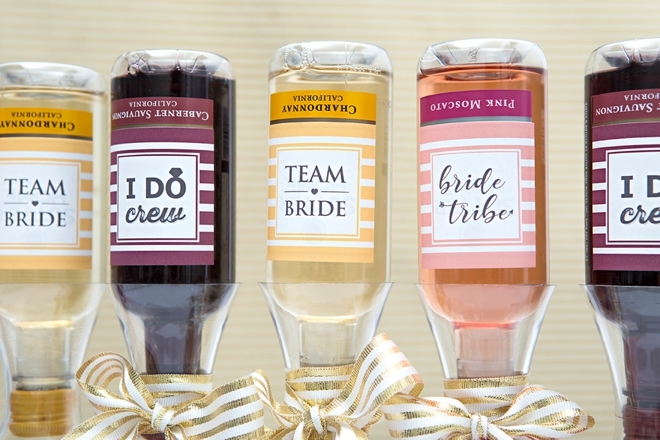 Use one (or all) of our 3 free printable labels to embellish this cute gift in a snap; we’ve got “I Do Crew”, “Brides Tribe”, and “Team Bride”. 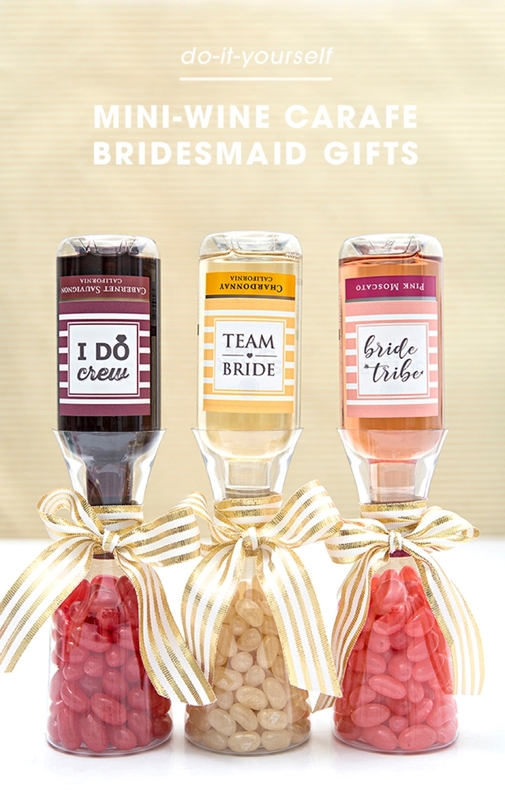 Whether they’re going to be a special gift during a part of your wedding celebrations, like your bridal shower, or whether they’ll be just for fun – I guarantee that your gals will LOVE these cuties! 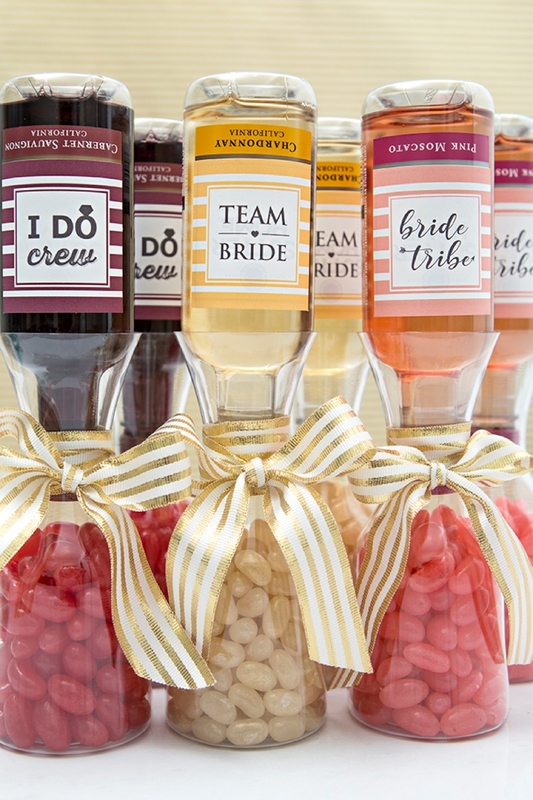 Fill the mini-carafs with your favorite candies! 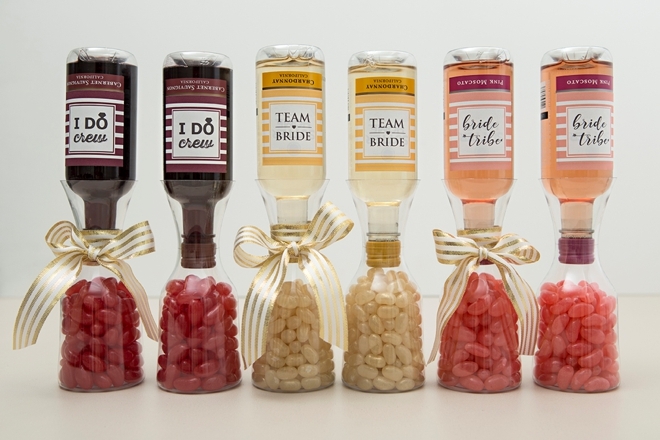 I used Jelly Beans, and the gold ones are Champagne flavor, but you can use any little sweets that will fit! 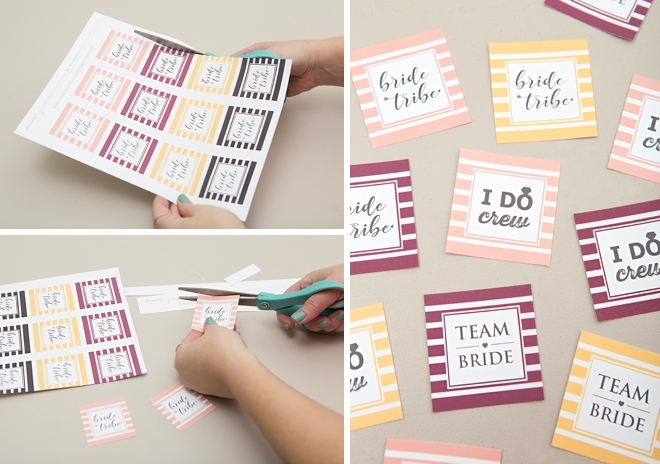 Our free printable labels at the end of the post! 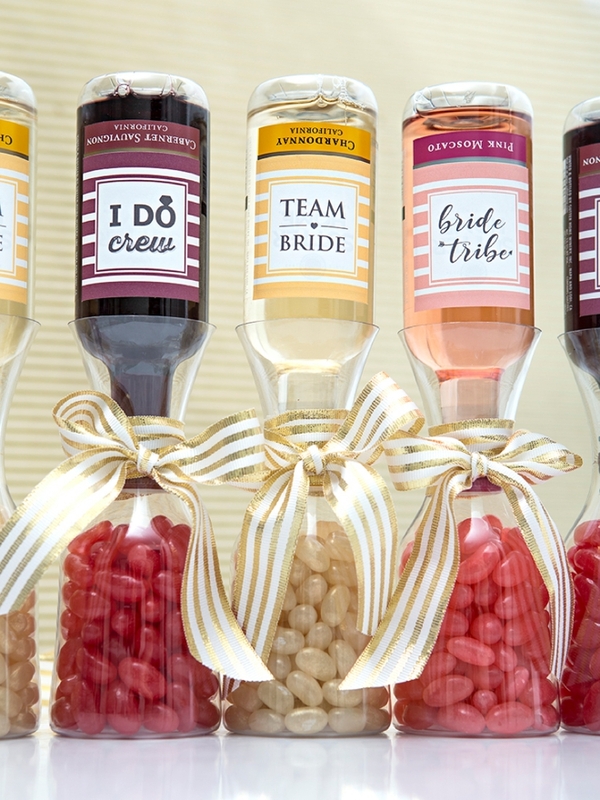 As I mentioned earlier, I used Jelly Beans but you can use any type of small candies that will fit in the carafes. 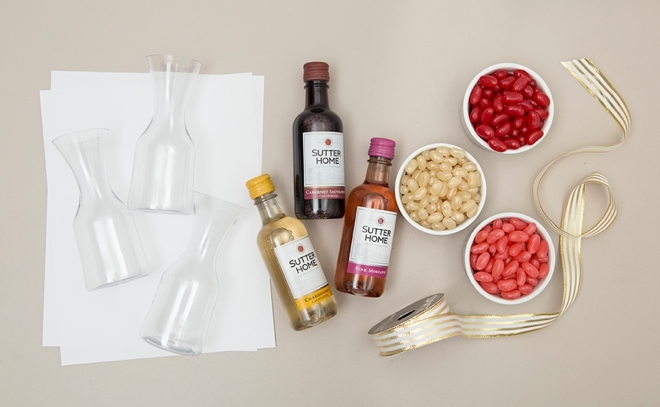 If you fill them to this level, each one will hold about 6.5 ounces of beans! 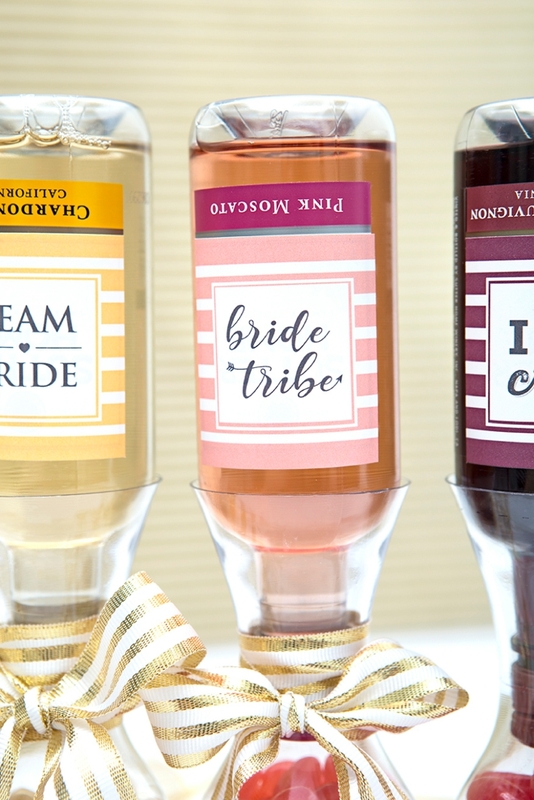 Download one of our free labels at the end of the post, print onto 8.5″ x 11″ sticker paper and then trim each one out. 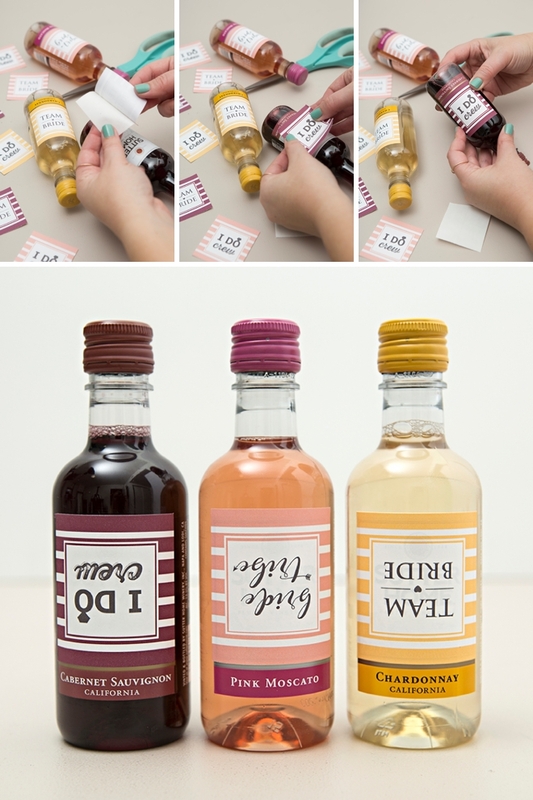 Peel the backing off the sticker and add each new label to the wine bottle – but remember to do it upside down! 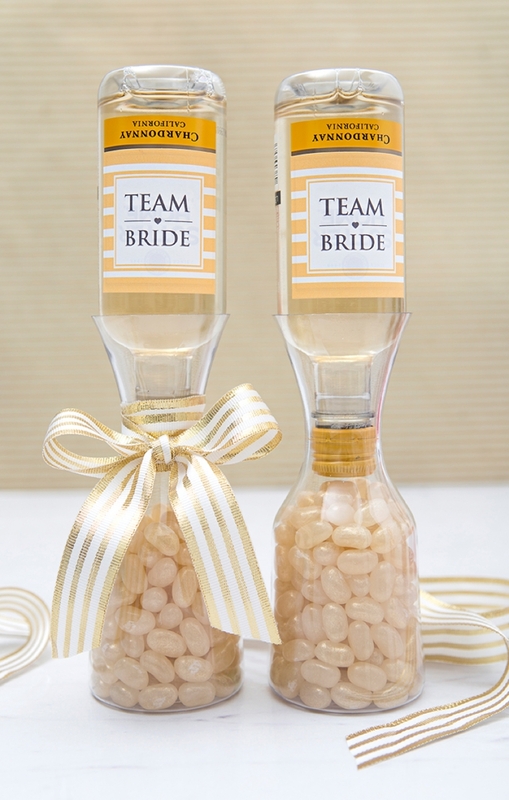 Add a wine bottle to each carafe! 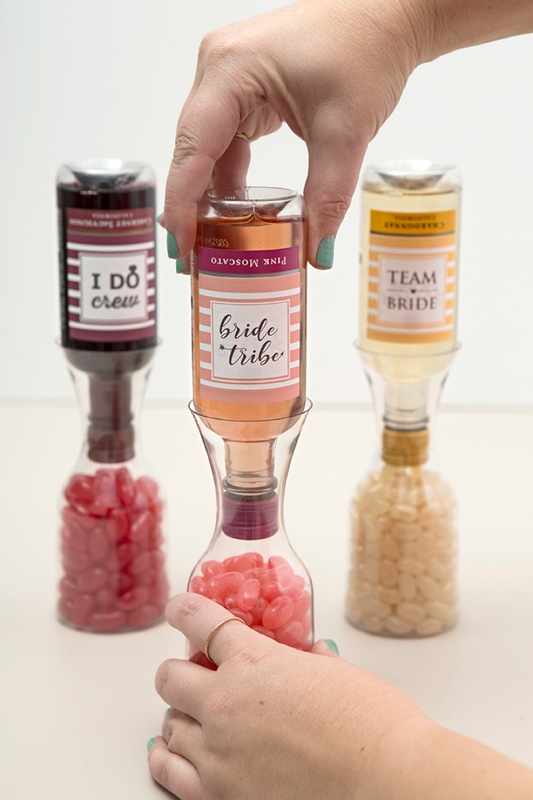 Finding out that these guys fit together SO perfectly was such a treat… and really the only reason that you’re seeing this project on the blog! 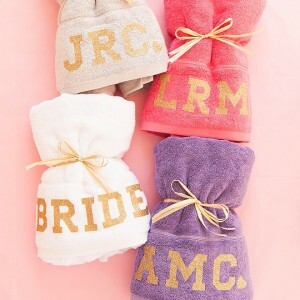 Add a ribbon bow, or don’t, your call, they’re cute either way… and that’s all there is to it! 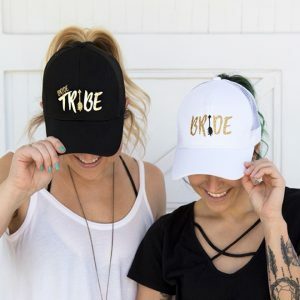 Your Bride Tribe is going to take care of you from engagement to grand exit, so make them a little something special to show them how much you care!